Dating back to the turn-of-the-last-century, this charming late-Victorian/Edwardian lavaliere glistens and glows front and center with an enchanting light lavender-blue sapphire weighing 3.25 carats. 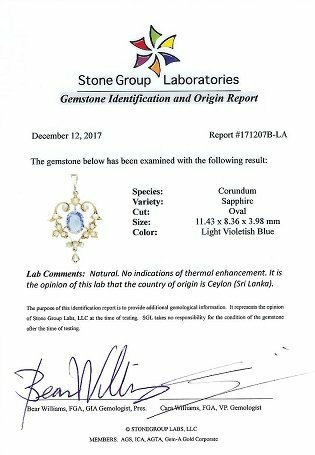 The natural, no-heat gemstone (accompanied by gemological report from Stone Group Laboratory) is enhanced all around with an array of lustrous natural pearls set in an open flowing foliate design frame. Lovely. 1 7/8 by 1 1/8 inches; the new chain measures 16 inches.